Background: Preeclampsia (PE) is one of the main causes of maternal and perinatal mortality and morbidity. Evidence shows that oxidative stress plays an important role in the pathophysiology of the PE. As catalase is a key enzyme in antioxidant enzymatic defense which protects cell from oxidative damage, in this study, we aimed to investigate the relationship between CAT-21A/T (rs7943316) polymorphism and PE susceptibility. Materials and Methods: This case–control study was conducted on 155 PE women and 159 normotensive pregnant women. Polymerase chain reaction-restriction fragment length polymorphism method was used for genotyping. Results: There was no association between CAT-21AT and TT genotypes and PE susceptibility. However, the CAT-21A/T polymorphism was associated with 1.6-fold higher risk of PE in dominant model (AA vs. AT + TT) (odds ratio [OR] 1.6 [95% confidence interval [CI]: 0.9–2.9]; P = 0.04). However, the CAT-21A/T polymorphism was not associated with PE in recessive model (TT vs. AA + AT) (OR 1.3 [95% CI: 0.8–2.1]; P = 0.4). Conclusions: The CAT-21A/T polymorphism could be a risk factor for PE susceptibility in dominant model. Despite many previous studies, the etiology of PE is still unknown. However, several factors involved in PE have been studied including abnormal trophoblastic invasion, immunological factors, endothelial cell activation, nutritional factors, genetic factors, and oxidative stress. Oxidative stress is caused by imbalance between reactive oxygen species (ROS) and the system's ability to omit active mediators or repair damage. As a result, lipids, proteins, carbohydrates, and nucleic acids are damaged, leading to cell death if the damage is extensive. On the other hand, there is evidence that genetic and epigenetic factors also play a role in PE. Considering the relationship between oxidative stress and PE, we aimed to compare one of the polymorphisms of the CAT-21A/T gene in pregnant women with and without PE in order to gain new insight into the etiology of PE and identify high-risk individuals. One hundred and fifty-five preeclamptic women and 159 normotensive pregnant women were selected from the ward of Obstetrics and Gynecology of Taleghani Educational Hospital of Shahid Beheshti University of Medical Sciences. Informed consent was obtained from all women, and the study protocol–in accordance with the Declaration of Helsinki–was approved by the Ethics Committee of Shahid Beheshti University of Medical Sciences. 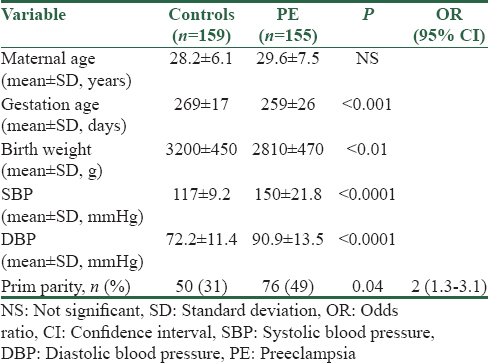 PE was defined as the presence of increased blood pressure (≥140 mmHg systolic blood pressure [SBP] or ≥90 mmHg diastolic blood pressure [DBP] on two or more measurements at least 4 h apart) and proteinuria ≥0.3 g/24 h or protein: creatinine ratio greater or equal to 0.3 mg/dL, after 20 weeks of gestation. Women with chronic hypertension, underlying renal disease, and/or insulin-dependent diabetes, twins or multiple pregnancies, hydatidiform mole, hydrops fetalis, liver dysfunction, systemic lupus erythematosus, and all systemic diseases were excluded from the study. Genomic DNA was extracted from 200 μl ethylenediaminetetraacetic acid-treated whole blood using salting out method and frozen at − 20°C until analysis. The analysis of CAT-21A/T rs7943316 polymorphism was performed by polymerase chain reaction (PCR)-restriction fragment length polymorphism method. The fragment containing the CAT-21A/T polymorphism was amplified using the forward: 5-AATCAGAAGGCAGTCCTCCC-3′ and reverse: 5′-TCGGGGAGCACAGAGTGTAC-3′ primers. The total volume of the PCR mixture was 25 μl containing 150 ng genomic DNA, 20 pM of each primer, 0.1 mM dNTP, 1.5 mM MgCl2, 2.5 μl PCR buffer ×10, and 1 U of Taq polymerase (Fermentas, Lithuania). The PCR conditions were as follows: 5 min at 94°C followed by 30 cycles of denaturation at 94°C for 30 s, annealing at 62°C for 30 s, extension at 72°C for 30 s, and a final extension at 72°C for 5 min. The 250-bp PCR product was digested by HInfI restriction enzyme (Fermentas, Lithuania) and incubated at 37°C overnight. The digested products were separated by electrophoresis on 2.5% agarose gel. The CAT-21T allele had no HInfI cleavage site and only produced a 250-bp fragment. However, the CAT-21C allele had one HInfI cleavage site and was digested to 177 and 73 bp fragments. Statistical analyses were performed using SPSS software (version 23; SPSS Inc., Chicago, IL, USA). The clinical and demographic characteristics of the both groups were compared via independent Student's t-test or Fisher's exact test. The independent effect of each polymorphism and haplotype on PE risk was assessed via logistic regression analysis. Values of P < 0.05 were considered statistically significant. The demographic and clinical data of 155 PE pregnant women and 159 normotensive pregnant women are presented in [Table 1]. The maternal age of women did not differ between the two groups. 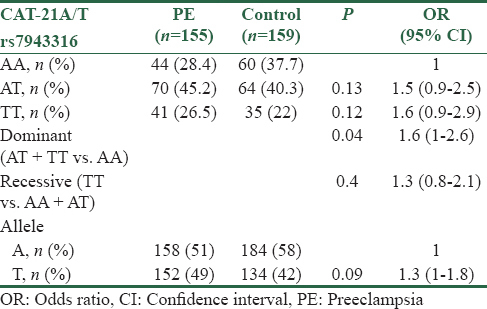 The birth weight and gestational age of neonates were significantly lower in PE group. The SBP and DBP were higher in this group. The frequency of prim parity was significantly different between PE women and normotensive women (49 vs. 31, P = 0.04). [Table 2] depicts the allelic and genotypic frequencies of CAT-21A/T (rs7943316) polymorphism in the PE women and controls. The CAT-21A/T (rs7943316) polymorphism was not in Hardy–Weinberg equilibrium in the studied population. The frequency of CAT-21AT and TT genotypes was higher in PE women (45.2 and 26.5%, respectively) compared to control group (40.3 and 20.5%, respectively); however, the differences were not statistically significant. Although there was no association between CAT-21A/T polymorphism and PE in recessive model, the CAT-21A/T polymorphism was associated with PE susceptibility in dominant model (AA vs. AT + TT) (odds ratio [OR] 1.6 [95% confidence interval (CI): 1–2.6]; P = 0.04). The results of the current study showed that the -21A/T (rs7943316) polymorphism of the catalase gene is associated with 1.6-fold higher risk of PE in the dominant model. However, the -21A/T polymorphism was not related to PE in the recessive model. Glutathione levels is needed for maintaining homeostasis, increasing lipid peroxide, and modifying protein. Under oxidative stress, glutathione levels decrease, causing vascular and tissue damage. Since catalase is an anti-oxidative enzyme, some studies have assessed the relationship between the activity of this enzyme and its polymorphisms and hypertension, diabetes, and other diseases. In some cases, single-nucleotide polymorphisms (SNPs) of antioxidative enzymes make an alteration in the enzyme's catalytic activity because of modifications they make in the protein structure, peptide signal sequence, RNA primary transcript, and alterations in promoter and regulatory gene elements. Therefore, the idea that polymorphisms could also change enzyme activity and make them more susceptible to diseases related to oxidative stress (such as hypertension, cerebrovascular accident, and PE) is not farfetched. Previous studies corroborated the relationship between CAT polymorphism and hypertension. In one study on the relationship between CAT polymorphism and the risk of cerebral stroke in patients with hypertension, 667 patients with untreated hypertension (306 with cerebrovascular accident and 361 without cerebrovascular problem) were included. The results showed that the -21 AA CAT genotype is accompanied with an increased risk of cerebrovascular accident in men with hypertension (OR = 1.77; 95% CI: 1.01–3.07). The results were also in line with ours, as they highlight the importance of dominant model. Moreover, this genotype increased the risk of cerebrovascular accident in male smokers and alcohol consumers, which may indicate the interaction between genetic and environmental factors. On the other hand, the -21 AT and -21 TT genotypes had a protective effect against cerebrovascular accidents in men with hypertension and moderate physical activity (OR = 0.3) and men without stress (OR = 0.01). The importance of other polymorphisms was found in another study, in which 1474 participants (273 men and 286 women) with hypertensive family members had hypertension, the researchers found that the combination of two SNPs (CAT-262 CT or TT and CAT-844 AA) in the catalase gene promoter region was significantly associated with hypertension. Few studies have been done on the relationship between catalase activity and its gene polymorphism and PE. One study showed that the serum activity of catalase in erythrocytes was lower in 47 women with PE (2.11 ± 1.34 U/g hemoglobin), compared with 48 healthy pregnant women (3.99 ± 3.15 U/g hemoglobin) and 50 healthy nonpregnant women (11.86 ± 7.56 U/g hemoglobin) (P < 0.05). Other researches had assessed catalase activity in gestational week 15 in women who were later afflicted by PE compared with pregnant women without PE. However, no significant difference was found between the two studied groups. The researchers concluded that if enzyme activity is different in those with PE, it is due to the oxidative stress accompanied with PE and not its cause. However, further research in terms of other polymorphisms and other populations is necessary to investigate this issue. In the present study, there was a significant relationship between CAT-21 A/T polymorphism and PE in the dominant model. However, further studies especially on the other polymorphisms are required to better understand the relationship between catalase polymorphism and PE. American College of Obstetricians and Gynecologists. Hypertension in Pregnancy. Washington, DC: American College of Obstetricians and Gynecologists; 2013. Cunningham FG, Leveno KJ, Bloom SL, Spong CY, Dashe JS, Hoffman BL. Williams Obstetrics. 24th ed. New York: McGraw Hill; 2014. p. 102-5. Betteridge DJ. What is oxidative stress? Metabolism 2000;49:3-8. Chelikani P, Fita I, Loewen PC. Diversity of structures and properties among catalases. Cell Mol Life Sci 2004;61:192-208. Uttara B, Singh AV, Zamboni P, Mahajan RT. Oxidative Stress and Neurodegenerative Diseases: A Review of Upstream and Downstream Antioxidant Therapeutic Options. Curr Neuropharmacol. 2009;7(1):65-74. Quan F, Korneluk RG, Tropak MB, Gravel RA. Isolation and characterization of the human catalase gene. Nucleic Acids Res. 1986;14:5321-335. Saify K, Saadat I, Saadat M. Influence of A-21T and C-262T genetic polymorphisms at the promoter region of the catalase (CAT) on gene expression. Environ Health Prev Med 2016;21:382-6. Jiang Z, Akey JM, Shi J, Xiong M, Wang Y, Shen Y, et al. A polymorphism in the promoter region of catalase is associated with blood pressure levels. Hum Genet 2001;109:95-8. Mansego ML, Solar Gde M, Alonso MP, Martínez F, Sáez GT, Escudero JC, et al. Polymorphisms of antioxidant enzymes, blood pressure and risk of hypertension. J Hypertens 2011;29:492-500. Watanabe Y, Metoki H, Ohkubo T, Katsuya T, Tabara Y, Kikuya M, et al. Accumulation of common polymorphisms is associated with development of hypertension: A 12-year follow-up from the Ohasama study. Hypertens Res 2010;33:129-34. Kim TH, Hong JM, Oh B, Cho YS, Lee JY, Kim HL, et al. Genetic association study of polymorphisms in the catalase gene with the risk of osteonecrosis of the femoral head in the Korean population. Osteoarthritis Cartilage 2008;16:1060-6. Hernández-Guerrero C, Hernández-Chávez P, Romo-Palafox I, Blanco-Melo G, Parra-Carriedo A, Pérez-Lizaur A, et al. Genetic polymorphisms in SOD (rs2070424, rs7880) and CAT (rs7943316, rs1001179) enzymes are associated with increased body fat percentage and visceral fat in an obese population from central Mexico. Arch Med Res 2016;47:331-9. Vialykh EK, Solidolova MA, Bushueva OIu, Bulgakova IV, Polonikov AV. Catalase gene polymorphism is associated with increased risk of cerebral stroke in hypertensive patients. Zh Nevrol Psikhiatr Im S S Korsakova 2012;112:3-7. Kouremenos N, Zacharopoulou IV, Triantafyllidi H, Zacharopoulos GV, Mornos C, Filippatos G, et al. Genes and genetic variations involved in the development of hypertension: Focusing on a Greek patient cohort. Hellenic J Cardiol 2014;55:9-16. Kolusari A, Kurdoglu M, Yildizhan R, Adali E, Edirne T, Cebi A, et al. Catalase activity, serum trace element and heavy metal concentrations, and Vitamin A, D and E levels in pre-eclampsia. J Int Med Res 2008;36:1335-41. Mistry HD, Gill CA, Kurlak LO, Seed PT, Hesketh JE, Méplan C, et al. Association between maternal micronutrient status, oxidative stress, and common genetic variants in antioxidant enzymes at 15 weeks' gestation in nulliparous women who subsequently develop preeclampsia. Free Radic Biol Med 2015;78:147-55.